In this new feature on the blog, we’ll take a city where multiple Billy Graham Crusades were held, and we’ll tell you a little more about those events. 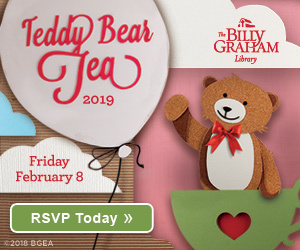 We may as well start with Billy Graham’s hometown and the home of The Billy Graham Library – Charlotte, N.C. 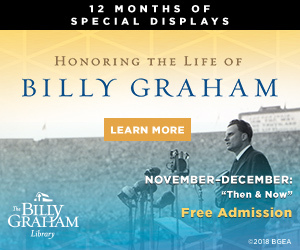 While Billy Graham held several meetings and events in Charlotte through the years, there were four official Crusades: 1947, 1958, 1972 and 1996. Billy Graham was 29 years old at the time. More than a decade into his ministry by this time, the meetings in the fall of 1958 drew more than 400,000 people over the course of the Crusade. The meetings were held in the Coliseum on Independence Boulevard (present-day Bojangles Coliseum), with overflow crowds watching on closed circuit television in Ovens Auditorium next door. On opening night, Billy preached an inspiring message entitled “Christ’s Answer to the World.” (You can see the full transcript of the sermon as printed in The Charlotte Observer here). 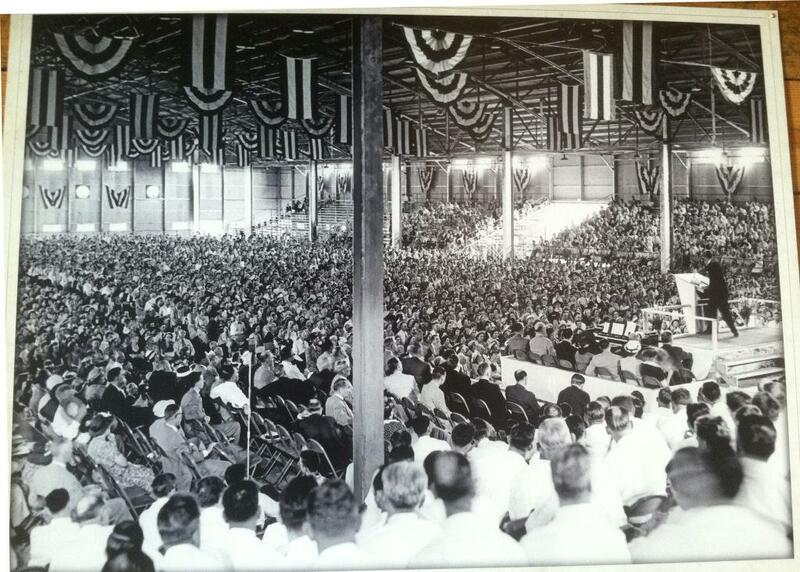 More than 70,000 attended these meetings in April of 1972, which took place 25 years and more than 150 Crusades after Billy Graham’s first one in Charlotte in 1947. The 1972 effort was a five-day “mini-Crusade” that added splashes of contemporary color but proclaimed the same glad tidings of salvation. A distinctly “home folks” atmosphere pervaded the meeting. The evangelist’s wife and three of their children, his mother his brother and sisters, and numerous relatives were present night by night. 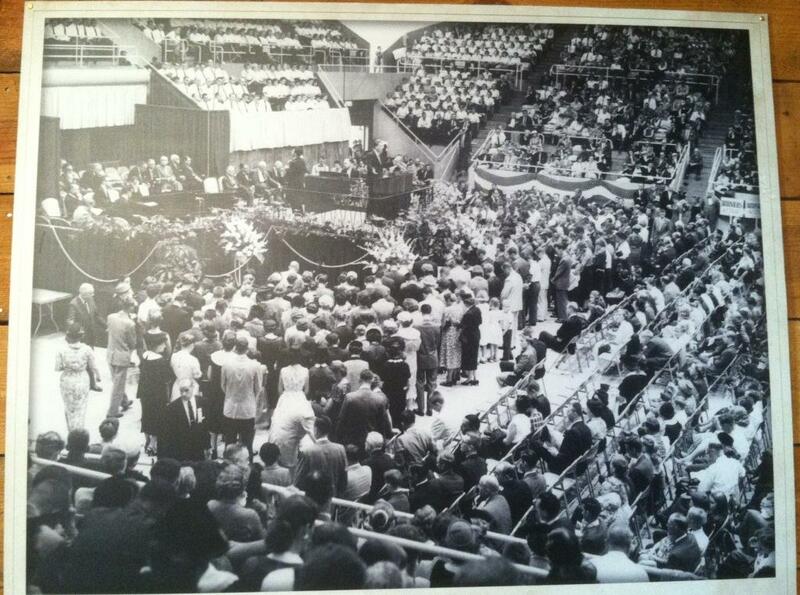 From beginning to end the coliseum was packed to capacity, and adjacent Ovens Auditorium was also filled by an overflow crowd that watched the service on a giant television screen. In addition, the Crusade was telecast live to ten stations throughout North and South Carolina. Several of the videotaped services were to be released later over nationwide television in the United States and Canada, as well as across Australia, Africa and Latin America. 1996 Carolinas Billy Graham Crusade at what is now Bank of America Stadium. 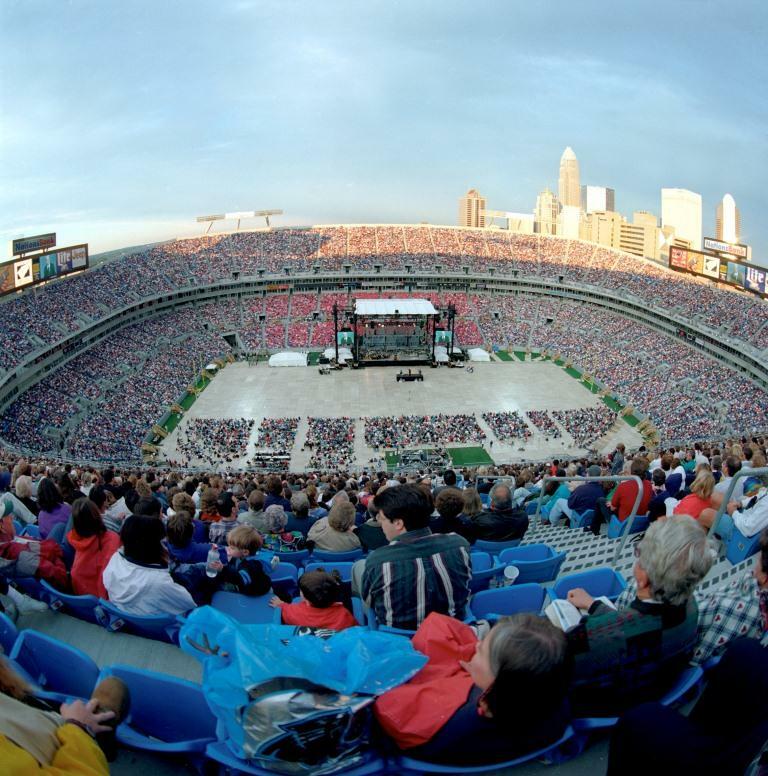 The Carolinas Billy Graham Crusade, held in what is now Bank of America Stadium, drew more than 330,000 during the four days in September of 1996. More than 25,000 volunteers from 900 churches representing 54 denominations across both North and South Carolina helped to stage the event. At age 77, Billy Graham’s preaching was described by local crusade organizers as stronger than it had been in years. Media coverage of the meetings was extensive, with the Charlotte Observer alone generating more than 250 pages of coverage. I love that Billy Graham never made any excuses for the Gospel. I love that he has always stood for Integrity and that He was never ashamed to preach it just like it says in The Word of God. I have much Respect for Him and humbled to have lived in an era that he has set forth a Godly example. Not only by preaching The Word but by living it as well. Praise and Honor to God for letting His light shine Brightly in this man of God and for the humble submission of Rev. 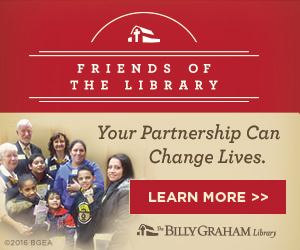 Graham to heed to his calling to help save the souls of many. Thank God for he and his family and all that have helped him achieve greatness for The Kingdom of Heaven!! Hi, Jannette. Thank you for your message. Unfortunately we don’t know if the video message will be shown, but you can listen to it online. Part 1: http://billygraham.org/audio/remember-lots-wife-part-1/. Part 2: http://billygraham.org/audio/remember-lots-wife-part-2/. My father Don Woodside came forward at one of the invitations in 1958. 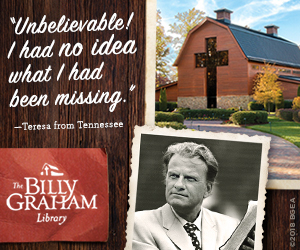 He is in the photo posted above, which also hangs in the Billy Graham library. Billy spoke at my graduation from Wheaton College in 1993, and I also attended his rally in 1996 in Charlotte. I count him as my spiritual grandfather, although he is in my sibling in Christ. What a blessing to the world! Even in death he is bringing Christ to the people. 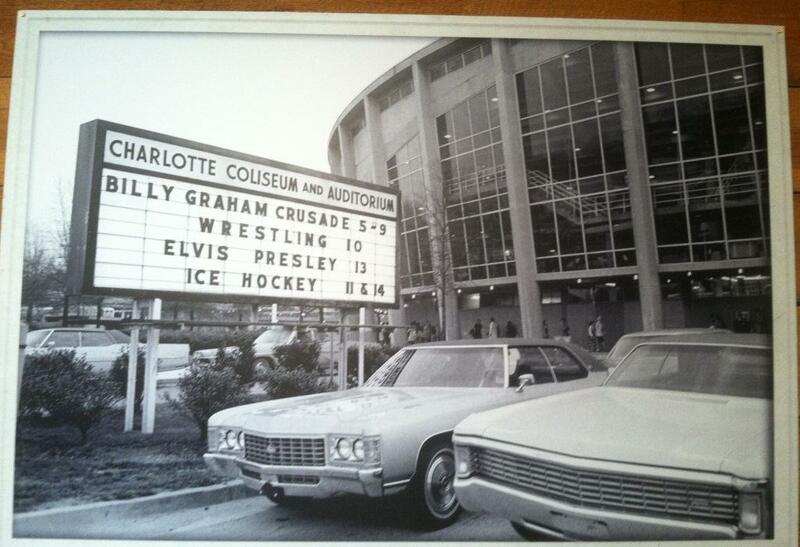 I remember attending a Charlotte crusade years back with my Mother. So powerful at the time; but the memory is just as powerful today.